The Department of Surgery’s Laboratory of Inflammation Biology and Surgical Science focuses on the role of innate immunity and its inflammatory mediators (cytokines) in the host response to severe trauma and burn injury, Gram negative bacteremia, septicemia and delayed wound healing. These studies, initiated in the early 1980’s, examine the contributions that proinflammatory cytokines, such as TNFa and IL-1, make to the host responses to nonlethal and lethal injury and infections. An inappropriate innate immune response appears to contribute to a variety of pathologic states, including endotoxic shock, ARDS, ischemia-reperfusion injury, delayed wound healing, and viral hepatitis. In recent years, the laboratory has shifted its focus to concentrate less on inflammatory mediators and more on the cell populations that regulate the communication between the innate and acquired immune responses. Greater emphasis has been placed on understanding the inter-cellular communication between antigen presenting cells and effector cells of the acquired immune response, particularly regarding the processes that may explain inflammation-induced cell death, and the role of cytokines and caspases in initiating this process, and NF-KB in antagonizing caspase-dependent apoptosis. Since 1995, the laboratory has been funded by the NIGMS to investigate the usefulness of gene therapy as a tool to deliver protein-based therapies in acute inflammation. Research has focused on 1) non-viral, plasmid based gene transfer, and 2) modifying the host response to adenovirus in an effort to reduce its inflammatory potential and to extend transgene expression. 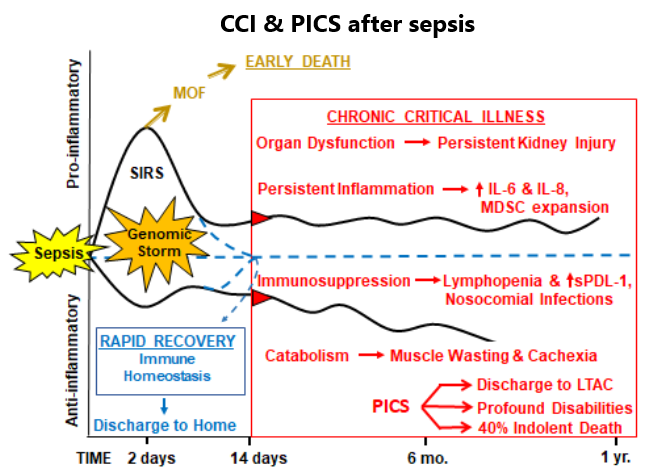 In more recent years, the laboratory has participated in a Large Scale Collaborative Research Program (Glue Grant) aimed at utilizing functional genomics and high-throughput proteomics to better identify and predict the subset of severely traumatized and burned patients that will go on to develop sepsis and multisystem organ failure. Based on the successes of the Human Genome Project, the program aims to understand, at a genomic and transcriptomic level, the diversity of the broad genomic response to human traumatic injury and bacterial infections. 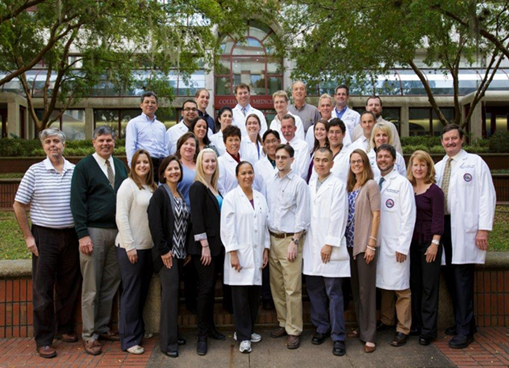 Most recently, the acute care surgery team, under the direction of principle investigator Fred Moore, MD, was awarded a National Institutes of Health P50 center grant to establish the UF Sepsis and Critical Illness Research Center to study the persistent inflammation, immunosuppression and catabolism syndrome (PICS) following sepsis in surgical intensive care unit patients. Our Department faculty works closely with other Department faculty members on this research, including Department of Pediatrics researcher, James Wynn, MD, who is leading sepsis-targeted observational human neonatal studies. The laboratory focuses primarily on translational biology and conducts research at all levels.There is also a strong commitment totraining and education, focusing on the graduate and post-graduate training of students, M.D.’s and Ph.D. scientists in inflammation-related translational research. Funded by the NIGMS, the laboratory has a T32 training program for M.D.’s interested in pursuing a multi-year training program in molecular genetics of inflammation biology. In addition, a limited number of other postdoctoral and predoctoral fellowships are available.